How to react to the Terrorist attacks in Paris? There are different ways to deal with the recent terrorist attacks in Paris. It is of course important to support and care for the victims and their families, to improve the security strategy, and to consider any measure to prevent similar tragedies to occur in the future. With respect to how our societies can react to such a threat, a lot has been discussed in the public discourse, and I do not think that I could add something valuable to the debate. This posting instead tries to focus on the more personal level. Recently, much has been written about war. The french president Hollande declared that "France is at war", and even Pope Francis seems to consider the attacks as a part of a "piecemeal third world war". I believe, this is a very dangerous image. The idea of war creates fear and hatred in people's minds, and right now, more than ever, decisions need to be taken calmly and without being driven by emotions or public opinion. No-one denies that one needs to be cautious, and should do everything to prevent further threats. Still, we need to be very attentive that we do not allow our minds to be poisoned. Via his twitter account, the Gyalwang Drukpa requested that "we must wage war against acts of terrorism with courageous acts of love". This may sound naive and esoteric in the light of the danger at hand. Still, if one thinks about it thoroughly, there is some truth to it. Merry Buddhist Christmas and a happy New Year 2015! another year has passed. Christmas is just around the corner. Isn't our calender a wonderful tool that reminds us of impermanence. Time goes by so quickly. 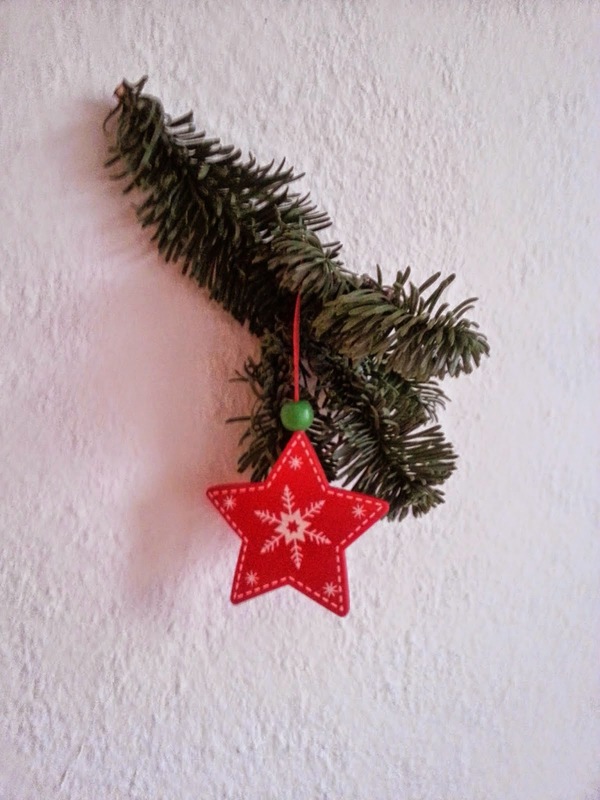 Without noticing, New Year 2015 is suddenly approaching. We have again become a year older. Of course, it shouldn't have come as a surprise, because the clock has been constantly ticking. Without noticing it, our life-span has decreased with each moment that passed. Therefore, we can also relate to big and joyful events like birthdays, New Year and Christmas as reminders of impermanence. So many extra-ordinary people have passed the last year. 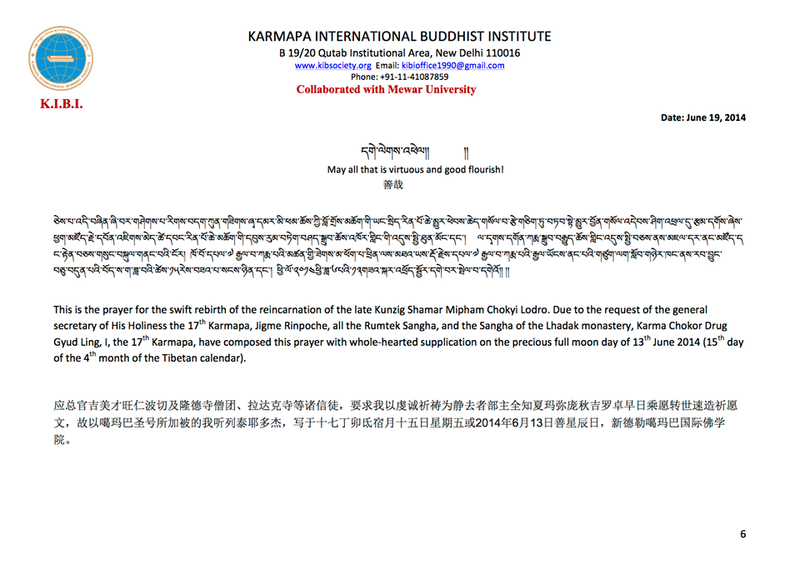 The loss of the great Tibetan Buddhist master Kunzig Shamar Rinpoche is still present in the minds of Tibetan Buddhists. Also numerous celebrities like Robin Williams, Shirley Temple, Peaches Geldof, Philipp Seymour Hoffman, Maximilian Schell, Eusébio, Mickey Rooney, James Garner and Lauren Bacall have left us forever this year. We may have had to mourn the demise of close ones, friends and dharma brothers and sisters around us. 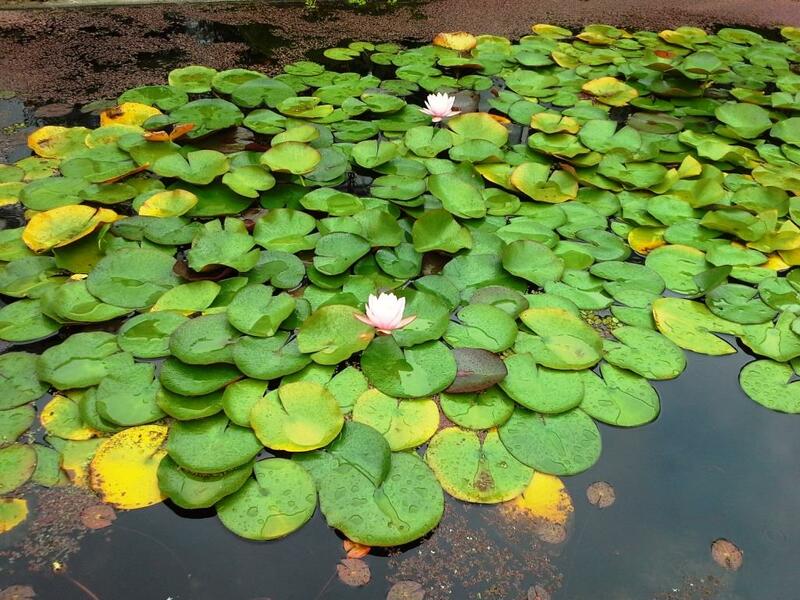 Buddhist teachings tell us, that every being which has been born will surely die one day. If even the greatest among us are subjected to death, the Lord of Death will certainly not spare us either. For a practitioner, it is actually important to become aware of death. In the Parting from the Four Attachments, which have been the subject of the last post, it is said that "if one clings to this life, one isn’t a dharma practitioner". In the context of these instructions, it is therefore explained that one should make an effort to develop an understanding of death and impermanence. This acts as a remedy for being too much involved with this life. Kunga Drolchog (Kun dga’ grol mchog, 1507-1566), considered to have been a previous rebirth of the famous Tāranātha, was an important master of the Jonang tradition. Traditionally, the Jonang tradition has been closely connected with the Sakya tradition as this work witnesses. It is a commentary on the important Sakya doctrine, the Parting from the Four Attachments (zhen pa bzhi bral) attributed to Sachen Kunga Nyingpo (1092–1158), founding father of the Sakya tradition. 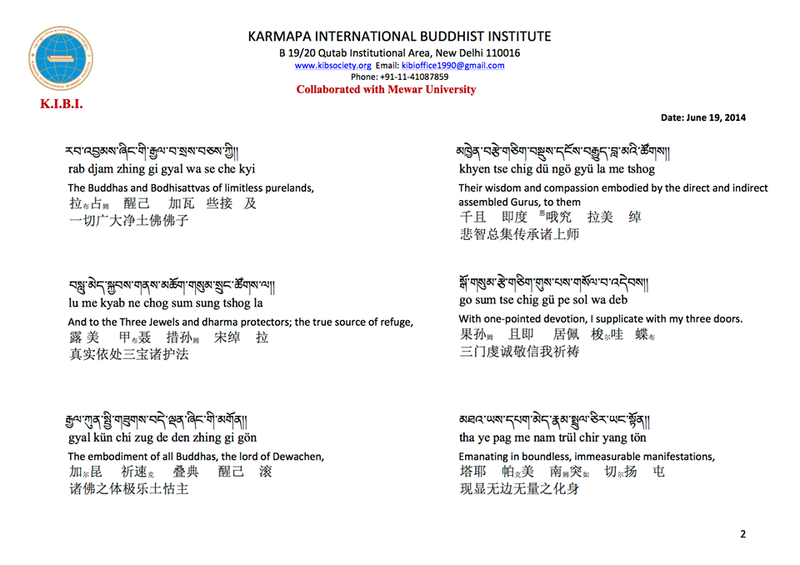 The verse is generally understood to be a summary of all of the Buddha's teachings. 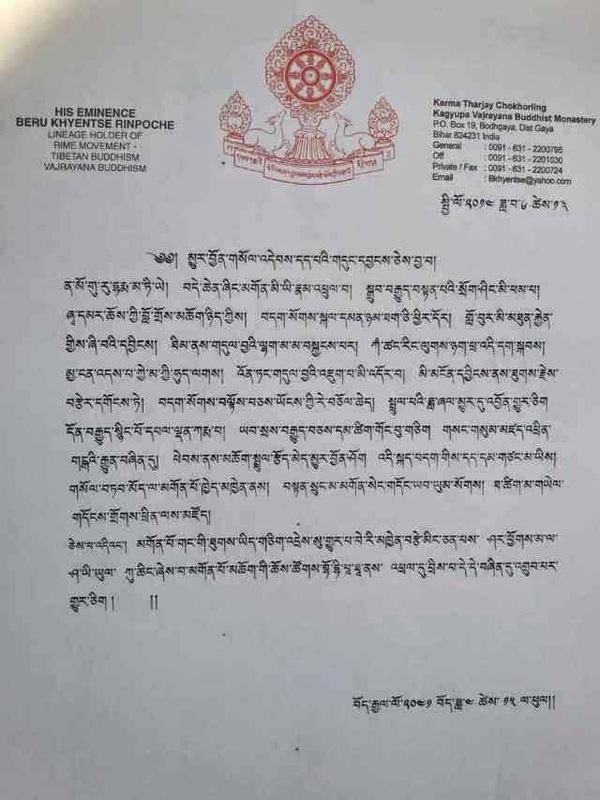 Sakya Jetsun Drakpa Gyaltsen (1147–1246) informs us that that Kunga Nyingpo received this fourfold instruction at the age of twelve in a direct vision from the Bodhisattva Mañjuśrī, having spent half a year in retreat under the guidance of Bari Lotsāwa (1040–1112). 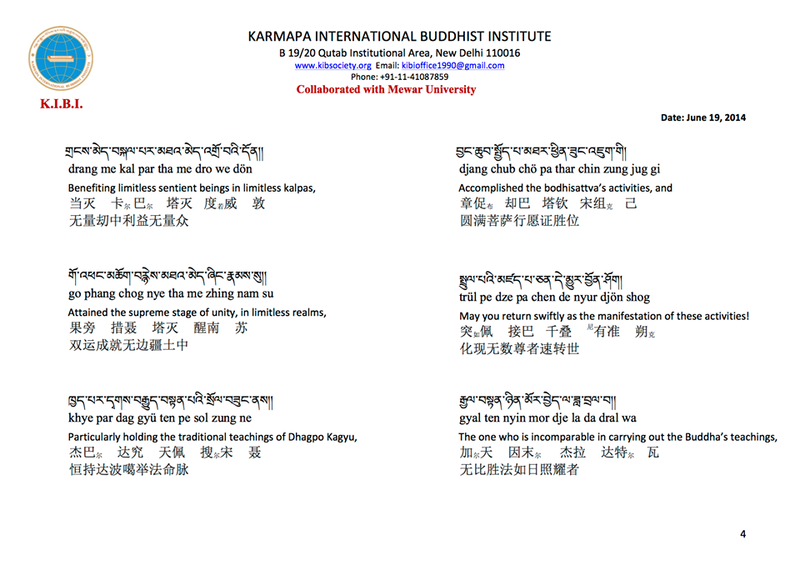 Being an important key instruction of the Sakya tradition, there are several collections of commentaries on these lines which have already been translated into English, but Kunga Drolchog's commentary has not been included in these collections. This explains why it is generally not so well-known, and why it is the only of the older existent commentaries on the Parting from the Four Attachments that has not been previously translated into English. The commentary is a synthesis of explanations by Rigdzin Drakpa and Sakya Paṇḍita and follows both commentaries very closely. A specificity of these commentaries is that they equate the four formulations of the Parting from the Four Attachments with the famous Four Dharmas of Gampopa. 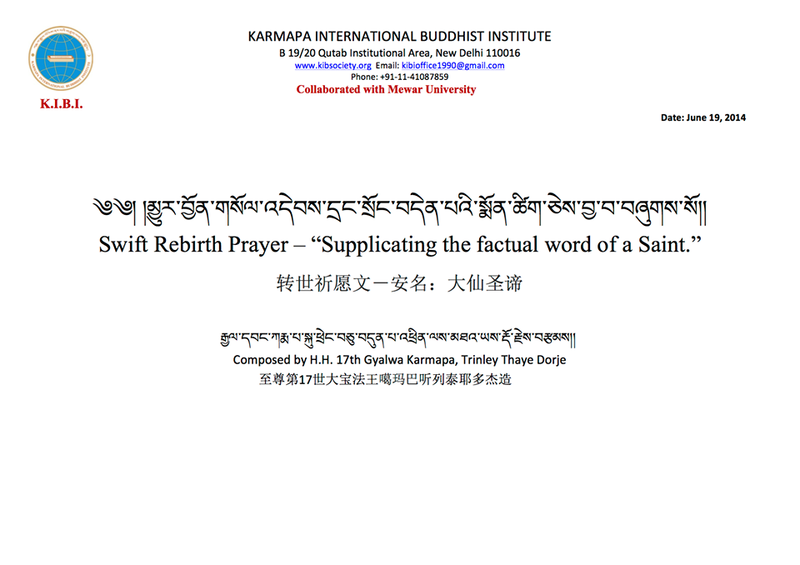 Update: After I uploaded my English translation and transliteration of Beru Khyentse Rinpoche's prayer for the swift rebirth of Kunzig Shamar Rinpoche (see below), Karmapa Thaye Dorje composed a further wonderful prayer. Having already been transliterated and translated into English by my friend Erin under the guidance of Khenpo Karsang Tenzin, I added it to the post. 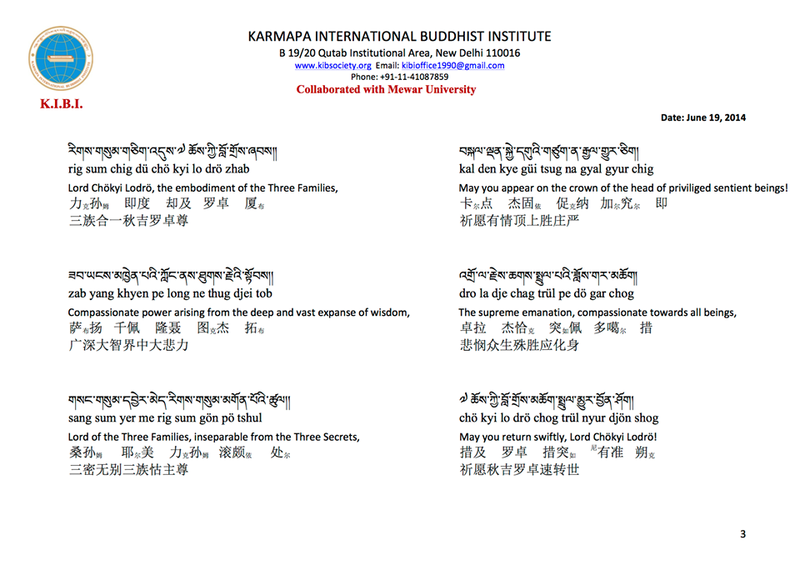 Further Update: There is now also a revised version of the prayer composed by Karmapa Thaye Dorje available which was distributed by the Karmapa International Buddhist Society. Consequently, the older version was removed and replaced by the latest version. A German translation of the prayer can be found here. 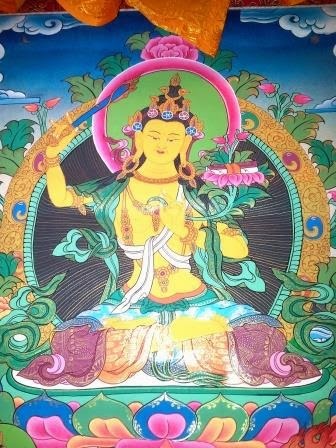 I bow down to Guru Chökyi Lodrö! 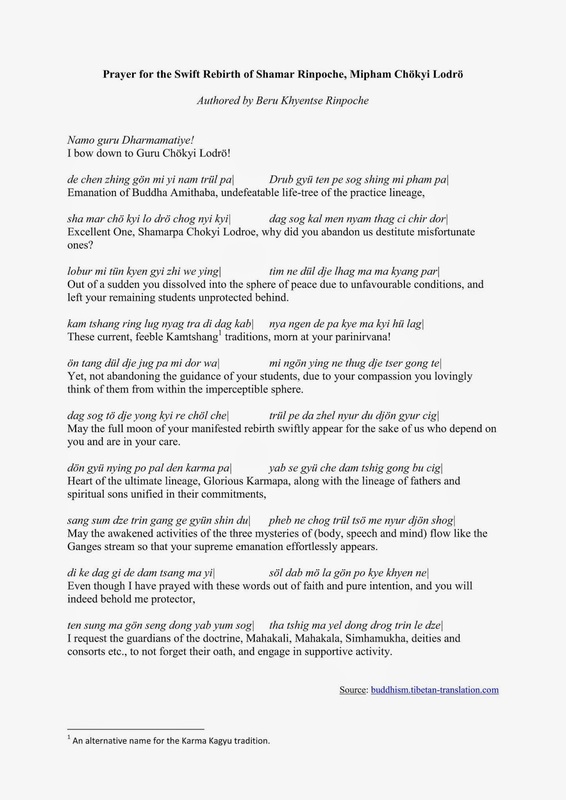 Excellent One, Shamarpa Chokyi Lodroe, why did you abandon us destitute misfortunate ones? Out of a sudden you dissolved into the sphere of peace due to unfavourable conditions, and left your remaining students unprotected behind. The long Kamtshang tradition has been weakened and mourns at your parinirvana! Yet, not abandoning the guidance of your students, due to your compassion you lovingly think of them from within the imperceptible sphere. May the full moon of your manifested rebirth swiftly appear for the sake of us who depend on you and are in your care. May the awakened activities of the three mysteries of (body, speech and mind) flow like the Ganges stream so that your supreme emanation effortlessly appears. I request the guardians of the doctrine, Mahakali, Mahakala, Simhamukha, deities and consorts etc., to not forget their oath, and engage in supportive activity. An alternative name for the Karma Kagyu tradition. A pdf of the English translation of the prayer can be downloaded here. Please be so kind and support Buddhism and More by sharing, linking, and liking! Many of you have probably already heard the sad news about the recent passing of Kunzig Shamar Rinpoche, Mipham Chokyi Lodro (1952-2014). It spread like a shock wave through the Karma Kagyu Buddhist centers in Europe. Not only was he the lineage holder of the tradition, but he had also spent years and years teaching in the West, mainly in the United States and Europe. Having just completed a weekend course at his Bodhi Path Center in Renchen Ulm, Germany, His Holiness unexpectedly passed away in the morning of June 11th 2014. It was learned that he suffered from a sudden heart attack and died immediately. Under the guidance of his brother Jigme Rinpoche who was also present when he passed away, all traditional procedures were followed. After that, Shamar Rinpoche remained in the so-called thugs dam, a post mortem meditative state carried out by experienced meditators, until Friday the 13th 2014. Since this date falls together with Saga Dawa, the highest Buddhist holiday, it is considered very auspicious. 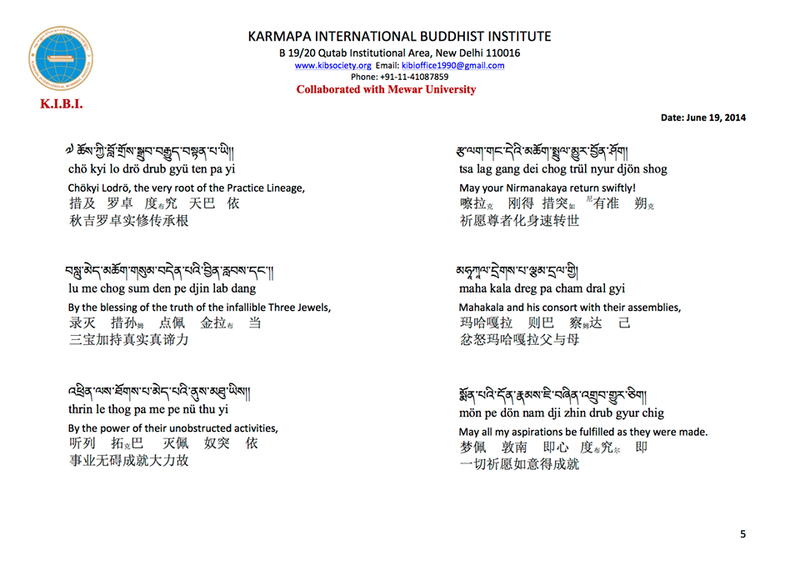 Need a Tibetan language expert? A blog for everyone with an interest in Buddhism, Tibetan Buddhism, Buddhist practice, philosophy, meditation, studies, life-style and more. Active contribution to the blog by commenting and asking questions is encouraged. Since the primary target of this blog is not the scientific community but a general audience, the use of diacritic signs and scientific transliterations is reduced to an absolute minimum.